Abstract: It is not uncommon for patients with odontogenic and non-odontogenic infection to present in general dental practice. Untreated infection can lead to life-threatening sepsis. 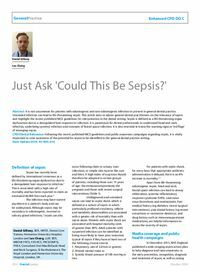 This article aims to advise general dental practitioners on the relevance of sepsis and highlight the recent published NICE guidelines for interpretation in the dental setting. Sepsis is defined as a life-threatening organ dysfunction due to a deregulated host response to infection. It is paramount for dental professionals to understand head and neck infection, underlying systemic infection and concepts of fascial space infection. It is also essential to know the warning signs or ‘red flags’ of emerging sepsis. Clinical relevance: Following the recent published NICE guidelines and public awareness campaigns regarding sepsis, it is vitally important to raise awareness of the potential for sepsis to be identified in the general dental practice setting. Author notes: Daniel Gillway, BDS, MFDS, Dental Core Trainee, Homerton University Hospital, London and Leo Cheng, LLM, BDS, MBChB FRCS, FDS RCS, FRCS(OMFS), FHEA, Consultant Oral Maxillofacial Head and Neck Surgeon, St Bartholomew’s, The Royal London and Homerton University Hospital, London, UK. Objective: To understand the definition of sepsis and the relevance to primary dental care.